Combine cornmeal and water in a saucepan. Add butter and cook until mixture thickens, stirring constantly. Combine hot mush with remaining ingredients. (Use an additional 1/2 cup warm water for more moist stuffing.) Stuff lightly into neck region and body cavity of turkey. Roast according to standard roasting directions. 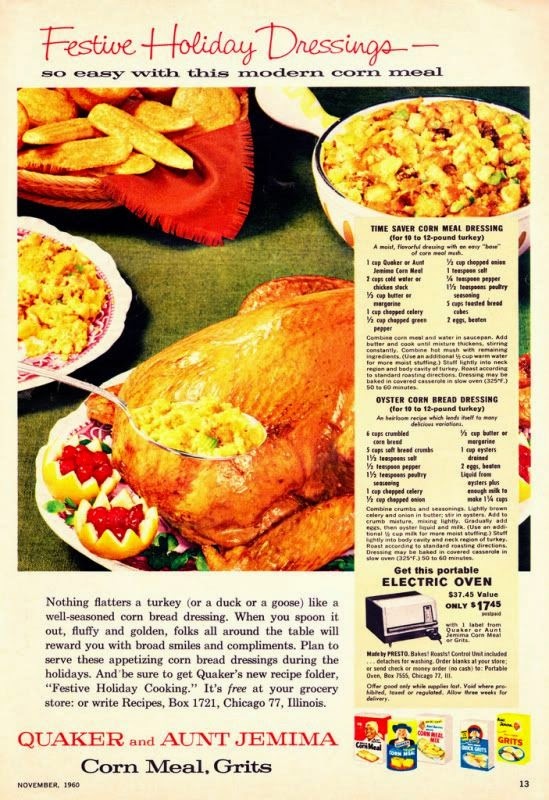 Dressing may be baked in covered casserole in slow over (325F) 50 to 60s minutes. Combine crumbs and seasonings. Lightly brown celery and onions in butter; stir in oysters. Add to crumb mixture, mixing lightly. Gradually add eggs, then oyster liquid and milk. (Use an additional 1/2 cup milk for more moist stuffing.) Stuff lightly into the body cavity and neck region of turkey. Roast according to standard roasting directions. Dressing may be baked in covered casserole in slow oven (325F) 50 to 60 minutes.